Mattel's classic toy is a perfect way to help celebrate an adventurous girl's birthday! When you shop for Barbie Party Supplies from Birthday Express, you'll be able to find everything you need for the big day, including simple tableware like plates, cups, and utensils, beautiful decorations like balloons or customizable candy bar wrappers, and fun favors! Glam up for a Barbie birthday extravaganza! Treat your little fashionista to a party centered on her favorite role model, Barbie! You know that Barbie is never without her charming fashion sense and sparkling personality, and a Barbie-themed birthday party is no different. 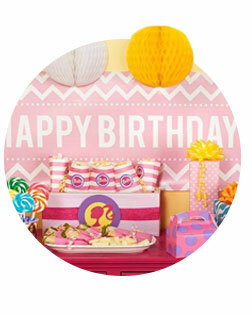 Find everything you need to put together a fabulous birthday party. Your little girl deserves the best! From decorations to games, activities and party favors, your Barbie party won’t be missing a thing. Send out the invitations and spread the news, it’s about to be a party she and her friends won’t soon forget. Of course each little girl invited to the party has her own favorite Barbie doll. Encourage a “Barbie and me” party for which you invite each guest to bring along her favorite doll. Make it extra special by setting up a place at the party table for each girl’s doll. Are you short on party ideas? There is no need to fret. Head on over to the Birthday Express Ideas and Inspiration blog for party tips and tricks to make the big day a hit. From decoration ideas to activity suggestions, you can keep each guest smiling from the moment they walk through the door. Build out your theme in one simple step with the Barbie Value Party Pack. 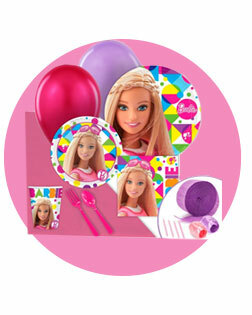 This pack comes equipped with everything you need to set up the perfect Barbie birthday party. Starting with invitations, step into a Barbie World and outfit the entire party area in pink and purple. Barbie is all about looking and being her best, and her party decorations are no exception! Make a statement with banners, colorful ribbons and balloons. There's no such thing as too much for Barbie, and that's why this party can't be without wild and bright colors. Make sure you have enough decorations to get the party started! All of the party decoration staples are right here at your fingertips. Surprise your little diva on her special day with a personalized photo banner. The bubble pinks, purples and blues on this banner are sure to fit your Barbie party theme. Picture it now: she'll be all smiles as she walks up to the party area and spots her picture and name displayed for all to see! Don’t let your table setting go without a bit of Barbie Sparkle. Not only will you protect your table from spills and splashes, but you’ll have another added touch of Barbie magic. Your guests will love getting to enjoy their birthday treats in the company of their favorite doll! It’s not a party without cake, ice cream, snacks and plenty of birthday treats! But you’ll need tableware to help you eat! Serve your delicious meal and dessert using cool Barbie Sparkle themed plates, cups and napkins. Everything you need to create a flawless table spread is right in one convenient place. Plus, these fun utensils and party plates will make cleaning up a bit more fun. Now that your decorations are in order, it's time to plan plenty of party activities. You'll be able to keep the little ones laughing and having fun with a variety of games, puzzles and activities. Barbie is all about fashion, so set up the runway and let the girls go wild playing dress up while you take photos galore! After all, a birthday party is all about the fun. Keep your guests entertained for hours with multiple games and activities they can enjoy. Let all your little guests get in the Barbie spirit with special Barbie accessories like a Barbie Headband. This addition could even become symbols of your daughter’s friendships as they remind her and her friends of the memories they shared at the party. Barbie Mariposa will fit right in at your Barbie Sparkle birthday party. Let your little one step inside the Barbie Fairytopia world for a day in this beautiful winged costume. She shouldn’t feel like anything less than a fairy princess on her birthday! The memories will last forever when you provide take-home gifts for all of your daughter's tiny Barbie friends. Make your party the talk of the town as you watch each guest go home and beg her parents for a Barbie party of her own! From filled favor boxes to treats and trinkets, impress every other parent with your stellar party-hosting abilities! Give each guest her very own kit of Barbie essentials with the Barbie Filled Party Favor Box. All she needs is a little hairbrush, nail polish and charm bracelet, and she will be ready for anything. Covered in purple and pink, this favor box is the perfect collection of Barbie accessories. Impress your guests with the extra Barbie Sparkle found in the Barbie All Doll’d Up favor box. These favor boxes are not only great for take-home gifts, but they can be part of the party fun! Gather your guests around to do Barbie makeovers and you’ll have even more photo opportunities!